In 2016, criminal lawyers honored Judge Mary Bacon with a portrait that hangs in her 338th district courtroom. March 5, 2018 — Judge Mary Bacon, a 1972 graduate of the then-UH Bates College of Law who went on to preside over a criminal state district court for 15 years, passed away March 1 at the age of 87. Bacon began her path toward a legal career in 1969 as a 39-year-old wife and mother of four children. She quickly realized she wanted to pursue a career in criminal law. "Criminal law was always of great interest to me," Bacon said in a 2016 interview. "I liked mystery books from the time I was a child. The cases that you read in criminal law are little stories in themselves." After earning her J.D., Bacon established her own practice in a converted motel and went on to specialize in family law for 10 years. Among the first female jurists in Houston, Judge Henry Schuble appointed her associate judge of the 245th Criminal District Court of Harris County in 1981. Two years later she became the judge of the 338th Criminal District Court after being appointed by Gov. Mark White. She retired from the bench in 1998. 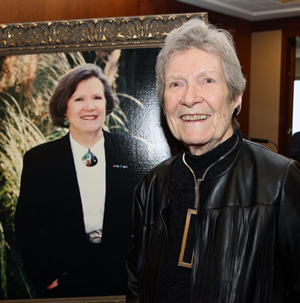 In 2016, she was honored by the Harris County Criminal Lawyers Association with a reception and portrait that hangs in the 338th district courtroom. Bacon sponsors the Judge Mary Bacon Scholarship at the Law Center, which was started by her four children. The scholarship is awarded to the man or woman who is balancing a family with law school as she did years earlier. "I've had nothing but positive thoughts about the Law Center," Bacon said at the time of the portrait unveiling. "When I finished law school, I certainly didn't think I knew everything, but I had tools to learn that were helpful." Bacon was preceded in death in 2013 by her husband of more than 60 years, Robert Bacon. She is survived by her daughter Elizabeth Johnson, and three sons, Bobby, Tom, and Doug Bacon. No services are planned. Memorial donations may be made to the Houston Grand Opera, 510 Preston St., Houston, TX 77002, or to The University of Houston to support the Judge Mary Bacon Award Endowment at the University of Houston Law Center, Office of Law Alumni Relations, located at 4604 Calhoun Rd, Houston, Texas 77204-6060.